Sometimes chocolate is the only thing that gets us through the day. Trust us, we have stashes of chocolate everywhere, just in case the need arises. 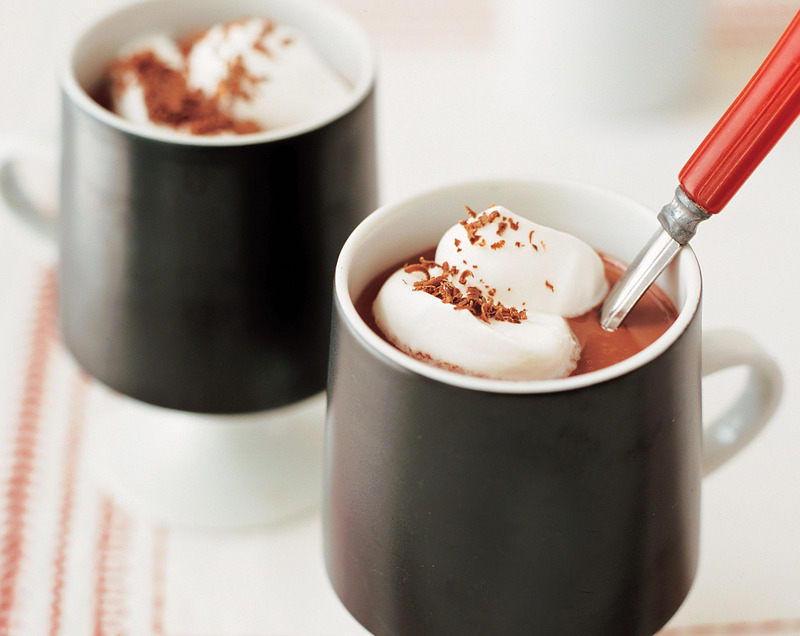 For lovers of European-style hot chocolate, this drinking chocolate is perfect to serve unadorned or topped with a dash of slightly whipped cream or a grating of dark chocolate. 1) In a small saucepan over medium-low heat, heat the milk and cream until small bubbles form around the edges of the pan. Remove from the heat and stir in the chocolate until completely smooth. 2) In a small bowl, dissolve the cornstarch in the water, completely smooth and thick. Add the vanilla and stir until completely smooth. 3) Let the hot chocolate rest for 10 minutes, uncovered, to develop its flavor and texture. Then breifly reheat over medium-low heat, stirring constantly. Serve in warm cups. This is something that I’m definitely going to try! How can you possibly go wrong with whole milk AND heavy whipping cream… this sounds tremendously decadent! !